New Spotify subscribers can only sign up if they have a Facebook account, a move that suggests that the online streaming music service is fully embracing its new Facebook partnership. Spotify has ditched its old business plan, but about 300 people at the consumer advocacy website GetSatisfaction don't think that decision was a good one. "Not cool," writes GetSatisfaction user spcomb, "My Spotify account isn't linked to Facebook, and it'll stay that way, thankyouverymuch. If I didn't have an account already, this would prevent me from signing up." Spotify's move affects all of its new users worldwide, though old users are (at the moment) spared from the forced integration. One of the reasons customers are peeved about Spotify's new terms is, of course, that with Facebook integration comes loss of privacy -- a key feature of the Spotify-Facebook partnership is the live, streaming updates of what music a user is listening to. 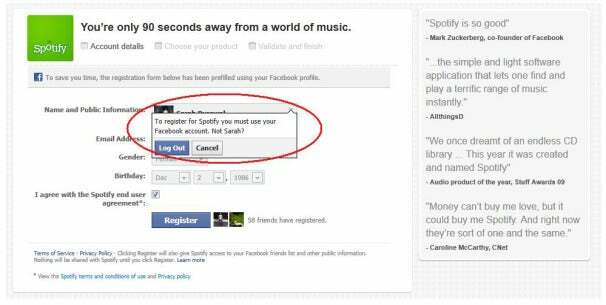 Spotify does give you the choice to sign up with a Facebook account and not share these updates, but many users are still annoyed about the Facebook account requirement --after all, not everyone wants sketchy Facebook integration, whether it's hidden or not. Interestingly, Spotify employee Darren's "official" response to the GetSatisfaction thread is that, while there's no way to sign up for Spotify without a Facebook account, this "does not stop you creating the Facebook account adding nothing to it and making it totally private as the Facebook account does not have to be actively used." Sure, that doesn't mean that creating another profile isn't a viable workaround, it's rather forward of Spotify to suggest you violate Facebook's terms of service. 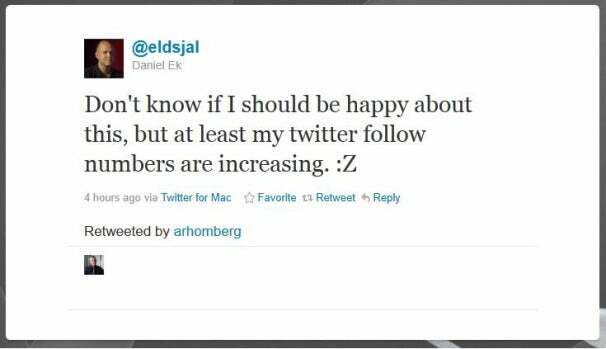 Spotify chief executive and founder Daniel Ek has been fielding complaints from users on his Twitter account. It looks like Spotify is taking the Facebook integration thing seriously, because, according to Ek, "you share everything by default. you can edit sharing-settings in the Spotify app on FB or preferences in Spotify." Ek also says that Spotify is using Facebook's sign-in process because it wanted to remove the “barrier to sign-up and create a more seamless experience. As we think our users are social." "Don't know if I should be happy about this, but at least my twitter follow numbers are increasing. :Z"
What do you guys think? Will Spotify's forced Facebook integration help its users be "more social," or will it slowly kill what was shaping up to be a pretty awesome music service?